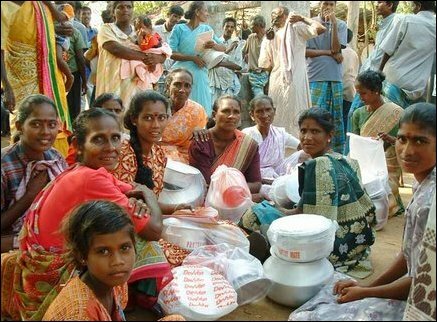 Trincomalee Children Fund (TCF) funded by a group of Trincomalee Tamils domiciled in Canada Friday distributed a consignment of cooking utensils, mats and other relief items to hundreds of tsunami victims in the LTTE held Eeachilampathu division, down south of the Trincomalee district. Mr.S.Umamaheswaran, Eeachilampathu Divisional Secretary inaugurated the distribution at his office, sources said. TCF co-ordinator in Trincomalee Mr.A.Parasuraman spoke at the event about the urgent need of providing relief and temporary shelter to Tsunami victims in the Eachchilampathu division who almost lost everything in the deadly waves last year. Earlier TCF-Canada distributed a consignment of cooking utensils to victims of Kadaloor village in Kinniya division and suitcases for Gopalapuram victims in Kuchchaveli division. Altogether TCF has distributed assistance worth of three hundred thousand rupees to Tsunami victims in district, sources said. One of the recipients of TCF assistance Ms Kalipillai said she was residing in her house at Palsenai village at the time of the disaster. 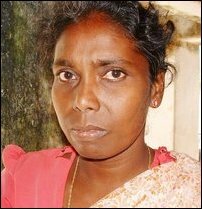 She lost one of her two children in the Tsunami deadly waves, which entered her house suddenly when she was staying with her two children and her husband Krishnapillai. She has been forced to live with her mother at Poonagar as her house was completely destroyed by deadly waves. Among the dead in Eeachilampathu division included two-year-old Jamunarajan Yugan and seven-year-old Jamunarajan Thushanthini, in a family washed away in the Tsunami waves, divisional secretariat sources said. According to Trincomalee district secretariat sources 52 deaths were confirmed and bodies were identified by their relatives in Eachchilampathu division, which comprises fifteen villages in nine Grama Sevaka division. However the report said about 100 are reported still missing. Mr.Umamaheswaran, Divisional Secretary said currently about 5660 persons of 1379 families are sheltered in welfare centres in his division. TCF has already been implementing an education development programme since the early part of 2004 in four villages Kanniya in Trincomalee division, Alankerni in Kinniya division and Killiveddi and Mallikaitheivu in Muttur division mainly focussing on students who sit for GCE Ordinary Level examination as they are deprived of standard education. Special classes are held for the subjects Science, Mathematics, Tamil Language and Social Studies are held for students in these villages in weekdays. Teachers deployed to carry out this programme are paid monthly from 1500 rupees to 2000 rupees by the TCF. 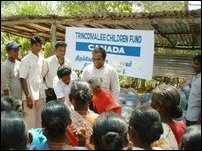 Trincomalee Tamils domiciled in Canada are funding this project, sources said.